Mystic Ark is a universe of mysterious doors, a huge multi-scenario RPG by Enix, that story-wise is not connected to The 7th Saga. 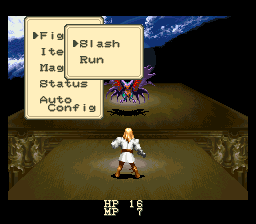 Although a few of its features and characters have been carried over from the preceeding game, any reference that depicts this work as The 7th Saga-II is erronious. 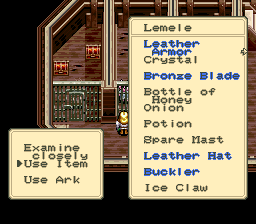 If such localization nomenclature were to be followed, Mystic Ark would more appropriately be called The 8th Saga. Nevertheless, our English patch will leave this game as Mystic Ark. The tale centers around a single fighter who is captured by an unknown force, turned into a wooden Figurine, and whisked away to a spooky back chamber of a palace-like mansion that has only recently materialized on a desert island. 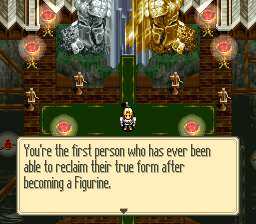 When he or she is awakened by a eerie voice, the fighter encounters many other Figurines throughout the premises, some of which are fellow combatants who must be freed from this curse in order to be reanimated and fight at the hero’s side. In searching for their homes, everyone must confront a number of powerful adversaries along the way that seem determined not to relinquish any of the seven Arks that not only harbor special powers, but hold the keys to opening new doors to other worlds. Hero Remeer or Heroine Ferris, whoever a player chooses to become at the start of gameplay - with an option to choose a new name up to 8-letters long - will explore the whole remote island chain and eight strange worlds before confronting the truth about the perpetrator that is turning almost everthing that exists into Figurines. For the most part, each world stands as a self-contained quest, much like the chapters of Dragon Quest-IV, and each new scenario appears stranger than the one that preceeded it. In the end, the hero must confront an unlikely villain in a situation that seems to defy rationality! Mystic Ark is not an average RPG. 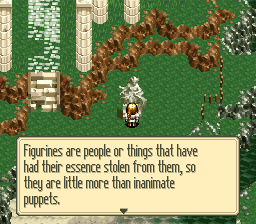 It plays old school, but it’s much deeper than “A hero goes off to save the world” plot. The main character may have no defined background, but its safe to assume the author intended it that way. In literature, this phenomenon is called the “everyman character” which means Remeer could be any male, Ferris could be any female. The desired effect is to have a player assume the main character’s role. So take the plunge and find your own answers as you enjoy this fine masterpiece that is Mystic Ark. Mystic Ark, commonly (and improperly) known as “The 7th Saga 2″ in some circles, is an RPG by Enix that spans worlds, and embeds a lot of adventure/puzzle elements into the genre. Disnesquick did the programming for our font, and the text was translated by Ian Kelley. You’ll pardon the brief description, but it’s after midnight, I’ve been working on this game virtually every available moment for the past two weeks, and I’m really, really tired. But the patch is out, so I guess it was worth it. I’m pleased with the result, but it took one hell of a lot of effort to get this far.